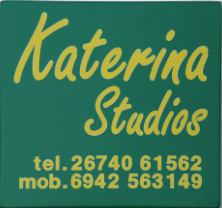 "Katerina Studios Agia Efimia Kefalonia" is a small family-run accommodation complex located in Agia Efimia, one of the most beautiful and traditional villages of Kefalonia. Katerina Studios is just 30 meters from the sea and only a few minutes walk you will enjoy the picturesque harbour of Agia Efimia with its sailing boats and the famous fish taverns, cafe bars all around it. The complex consists of 3 fully equipped studios that can comfortably accommodate 2-4 guests. All studios offer fully equipped kitchens, fridge, air conditioning, TV, WiFi and private bathroom with a shower. The building also has a furnitured shared patio with amazing panoramic view to the idyllic sunrise and the island of Ithaca. Enjoy your morning coffee or an evening beverage, relaxing and watch the sailing boats on the bay. The small family accommodation, Katerina Studios and our staff is at your disposal to make your holidays a different and memorable experience.